We are a society seeking simplification. From automotive design to mobile phone interfaces, our goal is to streamline the interaction of our lives. Fashion and technology create the devices that simplify all that is important to you. These devices become an extension of yourself that you love and protect. 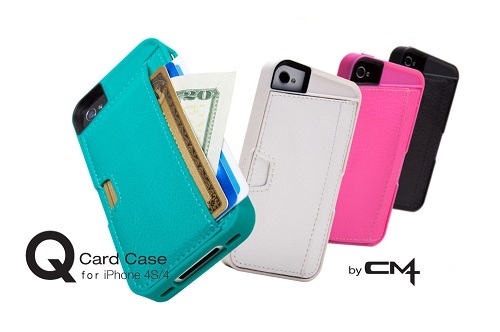 Unite your desire to simplify life and protect the devices you love with the Q Card Case for iPhone 4S / iPhone 4 by CM4. An exclusive patent pending soft-touch rubber and premium fabric construction blends to form a streamlined pocket to carry up to 3 cards plus cash. Meanwhile, the lay flat Screen Guard design and Natural Throw buttons provide ultimate screen protection and enhance the organic connection with your iPhone. The Q Card Case marries the essentials of a wallet to the form factor of your iPhone. At CM4 we believe the objects that enhance your life should blend perfectly with your design aesthetic. The Q Card Case does just that. Simplify with style. $39.99 & eligible for FREE Super Saver Shipping.